The old saying goes, “you can take the man out of the country, but you can’t take the country out of the man.” In this case, the country is the Australian outback and the man is horse trainer, clinician and equine entertainer Dan James. Known the world over as fifty-percent of the duo behind the popular “Double Dan Horsemanship Brand,” James and his partner, Dan Steers, have made a name for themselves putting on demonstrations and clinics that feature at liberty (meaning unrestrained by a bridle, saddle or other equipment) performances, trick riding and other unconventional training feats. While Steers remains based in Australia, James has made a home for himself in Midway, Kentucky, where he and his wife, Elizabeth, recently purchased a farm. While he plans to continue traveling the world with Steers giving the types of well-attended clinics and demonstrations that made the Double Dan brand famous, James’s plans for the coming years include taking on training projects–both horses and humans wanting to train horses–making a run at the 2018 World Equestrian Games and doing more work in television and film. As a child growing up in the rural Australian outback of Queensland, horses were not a hobby, but a tool for work for the James family. By age 14, he was leaving home for weeks at a time to start young horses for ranchers throughout the region. Before his 18th birthday, he landed a gig at Washpool Lodge, a premier Thoroughbred training facility that specialized in starting young horses under saddle and training seasoned racehorses. That job saw him riding 20 or more horses a day, galloping 12 to 16 racehorses in the mornings before saddle-breaking yearlings in the afternoons and working with his own training projects at night. It was only a few years before James went out on his own as a trainer, which included a stint in Hokkaido, Japan for their breaking and training season, which is opposite Australia’s due to being in opposite hemispheres. James returned to Australia, but he felt like he was in a rut. The more he tried to make it in the horse business, the more burned out he felt. In true “Dan James fashion,” that year off was spent mostly in the saddle, working on a 1.8 million acre cattle ranch managing their horses and gathering “mickey bulls” (bulls who had been lost and matured in the wild and become feral). In the off-season, James would compete in working cow horse events. It was at one of those events that James and Steers met for the first time. The two found that the more they talked, the more they had in common, especially when it came to their philosophy on training horses. Soon, they were performing demonstrations around Australia and, in 2009, brought their act to the United States. While in Lexington preparing for the World Equestrian Games, James was introduced to Frank Taylor of Taylor Made Farm, a large-scale Thoroughbred farm in Nicholasville, Kentucky. Taylor hired James and Steers to not only work with their yearlings-turning-two-year-olds, but teach their staff their methods. “We worked with their tough to handle colts, putting time into them so they would show better at the sales. Other farms started sending us their tough ones too. It was a very forward-thinking move for people in such a traditional business,” said James. Steers and James had made it, touring the world with their horses and building the unique emotional bond-based training methods behind Double Dan Horsemanship. Last year alone in addition to performing in the U. S., Canada and Australia, “the Dans” and their horses toured Europe, offering clinics and demonstrations in France, England, The Netherlands, Sweden, Denmark and more. With the support of his then-fiancé, Elizabeth, he began the search for a farm that would not only allow him to create an American base of operations for Double Dan Horsemanship, but also branch out with a few other ideas he had percolating over the years. This year, in addition to getting married, the James’s found the perfect farm for their aspirations just outside of Lexington on Leestown Rd. In case getting married and purchasing a farm weren’t going to keep them busy enough, the couple is expecting their first child together in early 2017. In addition to his own teaching and training at his new farm, he hopes to bring in outside clinicians to offer learning opportunities for a variety of different types of riders and riding styles, including eventing, reining, trail riding and obstacles. Offering opportunities for both competitive and recreational riders, his hope is for the farm to become known as a place equestrians from all disciplines come to learn. James also plans to expand his business back into the Thoroughbred market with the ability to start up to 50 yearlings each year. 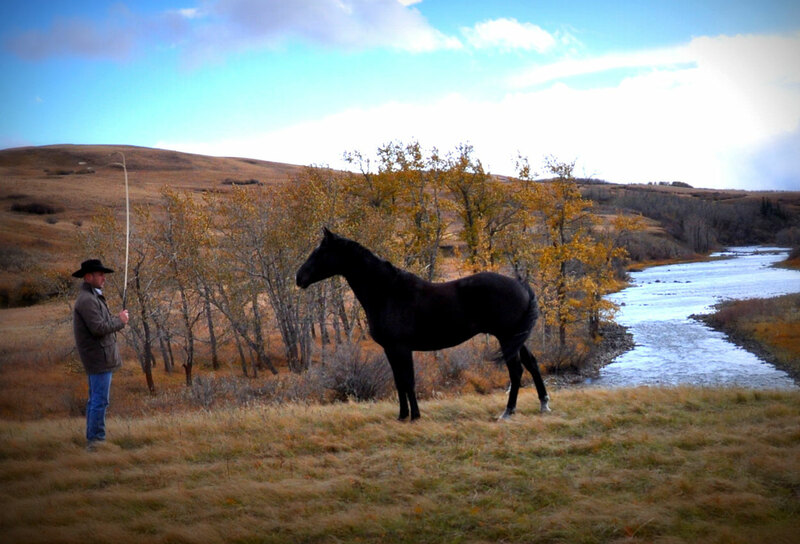 “My passion is helping people build more meaningful and more productive relationships with their horses,” said James. In addition, he is working on creating a horsemanship school, with hopes to launch it in 2018. With Elizabeth’s background in education as a professor in the University of Kentucky College of Agricultural and Equine Studies, she is playing an integral part of the program’s formation, according to James. As if that wasn’t enough, James is planning to make a run at the 2018 World Equestrian Games, both as a performer and as a competitor on the Australian Reining Team. As business ramps up in the coming few years, so will his life. James is excited about what the future holds, both professionally and personally and credits his wife with making much of it happen.